Home » Free » No Expiration Date » I’m Khaliji! http://www.line-stickers.com/ – I’m Khaliji! 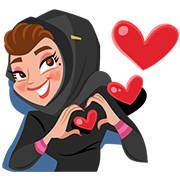 Line Sticker | Express what’s on your mind in style with Khaliji stickers! You asked for it and we delivered! They are back! Enjoy using our newest “Iʹm Khaliji” sticker set. LINE Sticker Special Edition LINE JELLY The Seven Deadly Sins Marry Me!